Fish rearing beginners are sometimes at pains to understand why pond filters are necessary for their koi ponds. They equate theirs to a natural lake but forget that there is a significant difference between the two. A natural pond has a physical mechanism that maintains the best ecosystem for the fish to thrive. Typically, a natural lake has a stream that brings water into it and sometimes another that takes it away. This helps flush fish waste and maintain the necessary balance between the different microorganisms, plants and the population of fish required. To achieve the same level of an ecosystem in your garden pond, you will need a filter – and the best one for that matter. Below is a review of the best pond filters around that will turn up trumps in your fish rearing. Have a look! One of the best reasons for having a pond filter is to keep the water clean and clear for the fish to do well. Natural ponds have plants that the fish feed on, and soils, as well as, rocks where microorganisms can be found. These microorganisms form the natural pond cleaning system by working on the dead plants and animals that may make the water inhabitable for the fish. But why can’t they do the same for artificial ponds? The answer to this question is simple. Your garden pond may not have soil and plants. This means that the conditions necessary for the microbes are insufficient. Fewer microorganisms mean ineffective natural pond cleaning system. The dead animals, plants, and poop will then make the water smelly and cloudy. To make matters worse, your pool will not have an inlet to replenish the necessary ecosystem for your fish. A pond filter helps keep the appropriate aquatic environment making the fish feel at home. They also make the pond smell-free and clean to your benefit, and of those coming to see what you have been up to lately. Your pond size: the type of filter you go for is very much dependent on the volume of the pond and the number of fish. Of course, the more fish you have, the more the need to clean it frequently – you know, the poop, and all. The size of the pond is measured in gallon capacity. It does not mean that you can go for a more substantial capacity for more efficiency. Determine the volume that your pond holds and make your decision on the filter based on that, and your fish will be glad you did. The type of filtration: depending on the current situation of your pond, the pond filter may utilize a combination of systems such a chemical, mechanical and biological. However, the most common among them include biological and mechanical filtration systems.Biological filtration is critical for the maintenance of a healthy ecological balance within the pond. Mostly, the filtration process works to remove any harmful microorganisms that would threaten the well-being of your fish and water ponds. It is not unusual for the biological and mechanical systems to combine and create the most appropriate environment for the fish.The mechanical filtration works like a sieve by picking any organic debris in the water. This waste may be from the water plants or from outside the pond like grass and leaves. It can also include pieces of food that people feed the fish. The position of the pond filters: pond filters can further be categorized as either external or submersible. Some filters are designed to be inside the pond and others outside. It will depend on your preference and budget.The submersible filters work within the pond and depending on the condition of your pond, regular maintenance and cleaning is necessary. External filters are not within the pond but on the landscape. They are easier to clean and maintain. However, you may need to employ a variety of methods to conceal it. The design of the filter: there is a wide variety of filter shapes and sizes.You will commonly find pressurized filters in koi ponds. They utilize both the mechanical and biological filtration processes. These filters can either be external or submersible and work by using a higher pressure to clean the pond. Therefore, they will need an electrical outlet to operate.Canister filters are commonly placed on the pond’s water level. They are usually biological and are easy to maintain, as well as, clean.Box filters function by allowing water to pass through different stages of the filter media. They utilize both biological, as well as, mechanical filtration systems to clean the pond. Typically, box filters are submersible and so require more maintenance and cleaning. 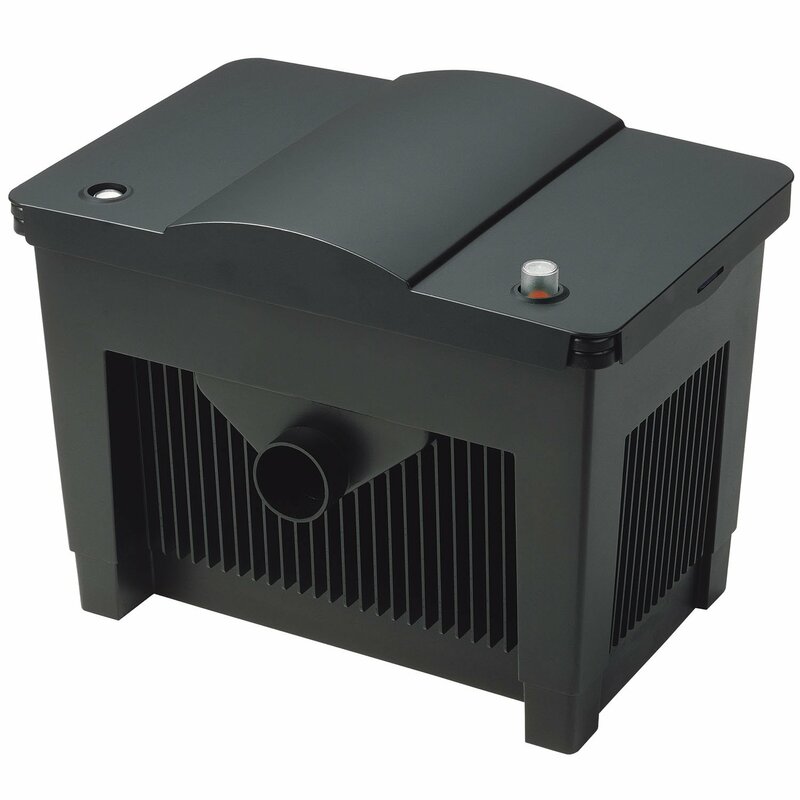 This pond filter may be an excellent choice if on your hands is a 4000-gallon capacity pond with an average biological load. The product utilizes the UVC ultraviolet purifier together with best quality pressure filters to keep harmful algae at bay and make your water clear. The pond filter also gets rid of bacteria and other hazardous pollutants that can jeopardize the well-being of your precious fish. This product comes with BioSmart filters that enhance the growth of beneficial bacteria. 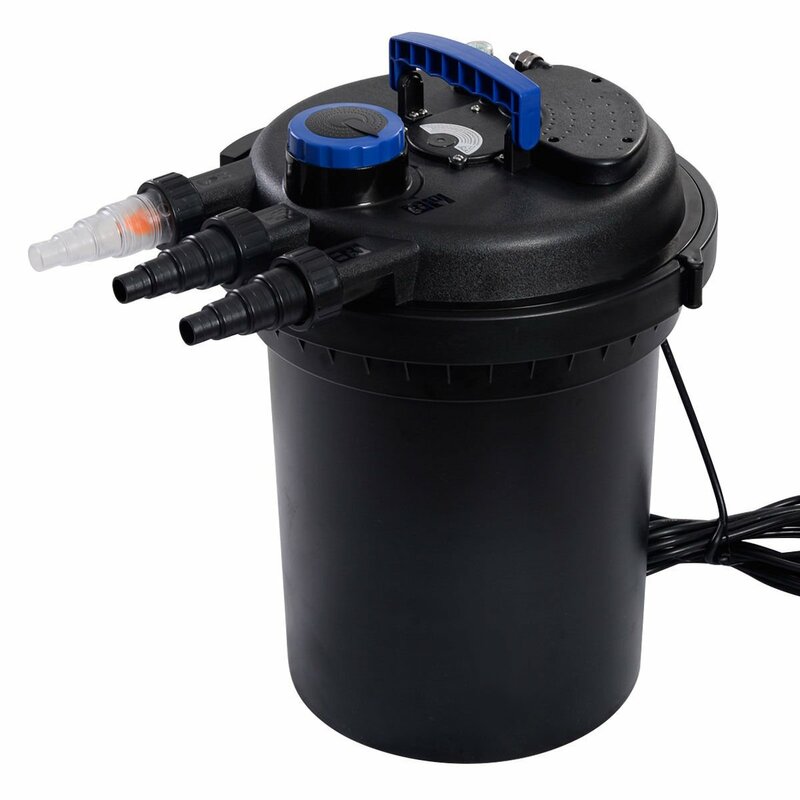 Unlike other pond filters in the market, this product has an efficient built-in mechanism that does away with the need to manually unclog the filters periodically. It is also quite user-friendly with features such as sludge drain and the temperature gauge. 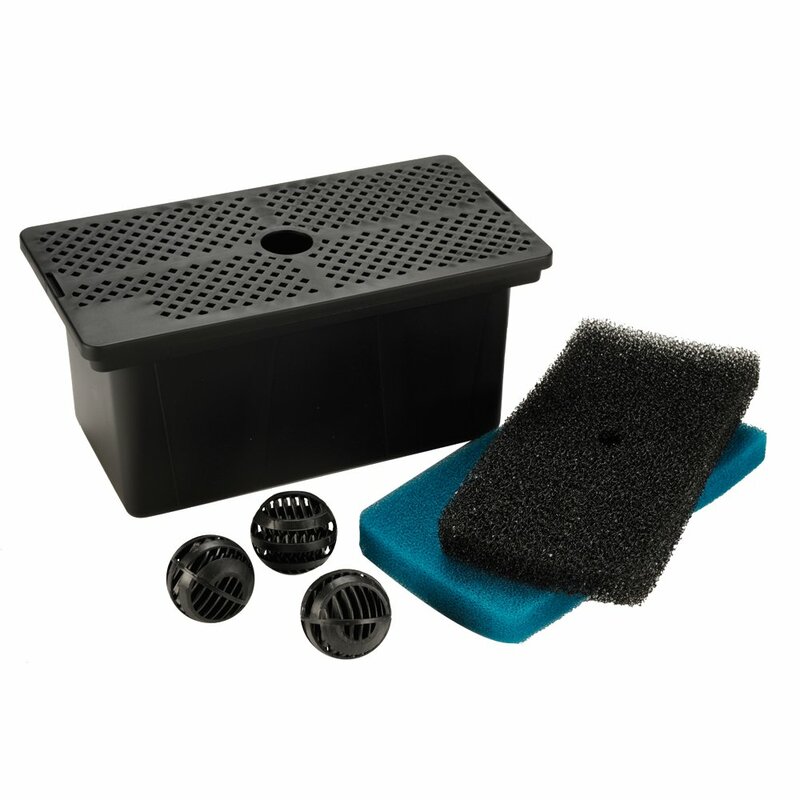 The pond filters have comfortable handles for squeezing and pulling out the filter pad. 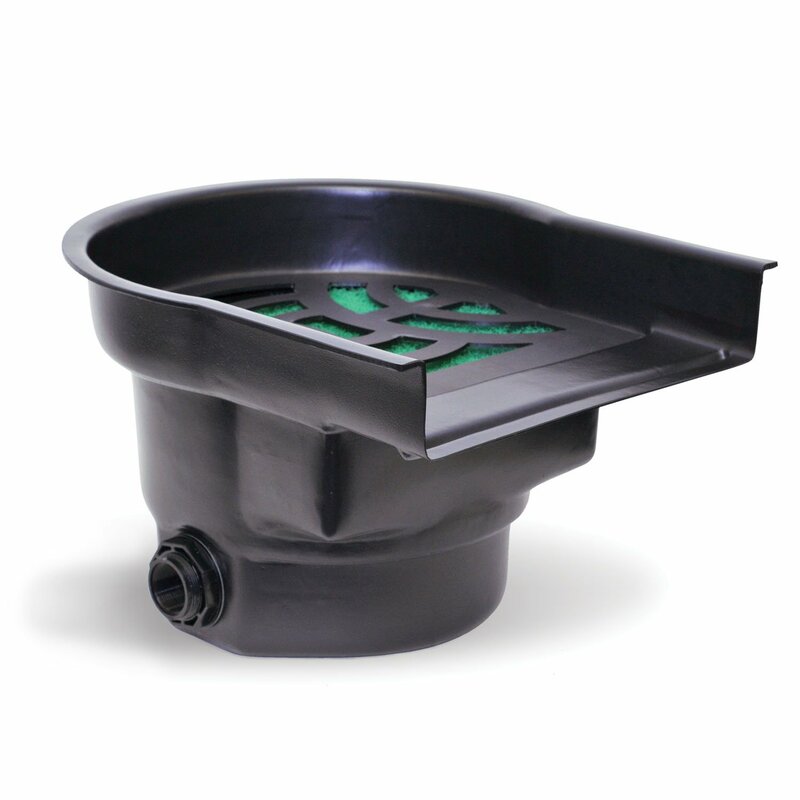 The pond filter is best for medium-sized ponds – in the range of 5,000-gallon capacity. It is also best for moderate biological load – the fish population need not be so significant. If you have a small pond on your property, then this kit may be the most appropriate. The kit comes with everything that you may need to start your own pond. Its low water fountain pump is water efficient and will save you on water bills. This kit employs BioBalls and the filter to create an appropriate environment for the good bacteria to thrive. The filter kit clean and prevent the accumulation of debris in water ponds. This utility reduces the need for maintenance increases the life of the pond filter – who wouldn’t want this? If you have a fish pond of about 500 gallons, then this product may be among the best. It promotes the thriving of good bacteria for the benefit of the fish. The filter box comes with an excellent filter, coarse filter, and the bio-balls. You will need to use a pump with this filter box for efficiency. However, you will have to deal with frequent clogs from time to time – this demands frequent maintenance like on a weekly basis. Atlantic Water is a company that has carved a niche in quality water products, and this pond filter is a testament to their commitment towards that goal. The filter has may be among the best biological filtration processes. 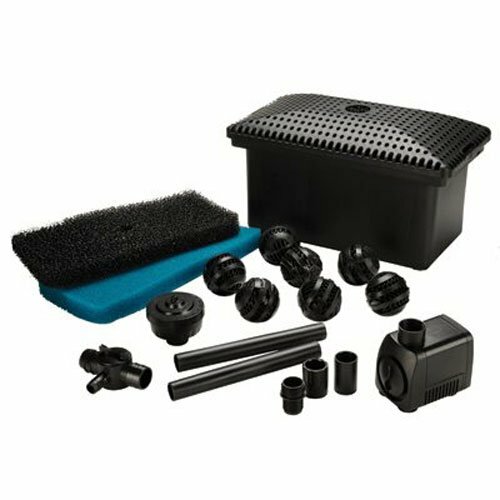 This product comes along with other accessories such as filter pad, media bag, removable bottom gate and FIPT bulkhead designed to keep your water clean throughout. If you have a medium-sized pond, then this filter may be a perfect choice for you. If you have a garden pod, it is imperative you put much effort to ensure it is clean and free from awful smell – you would not want your fishing moments to turn out as your least favorite. The best pond filter reviews keep your water crystal clear and smelling nice. They are easier to maintain and clean. That said, OASE BioSmart 5000 Pond Filter is a decent choice. The product has a powerful filter that deals with debris and quite the user-friendly type. This affordable pond filter may be what your plants and fish were missing to thrive.